NASA scientists observed Greenland, and found there’s a huge crater beneath Greenland’s ice. Scientists believe it came to exist after a large meteorite hit the Earth. Earlier this week, scientists also found another interesting fact about Greenland – there are large deposits of sands which could be exported to countries that need it, establishing a stable income for Greenland. The newly discovered huge meteorite crater beneath Greenland’s ice measures a little over 22 miles wide, and is freely considered one of the largest meteorite impact sites on the planet, as long as scientists confirm that it was created as a result of an impact between a large space rock and Earth. At the moment, the crater is blanketed by a mile of ice. 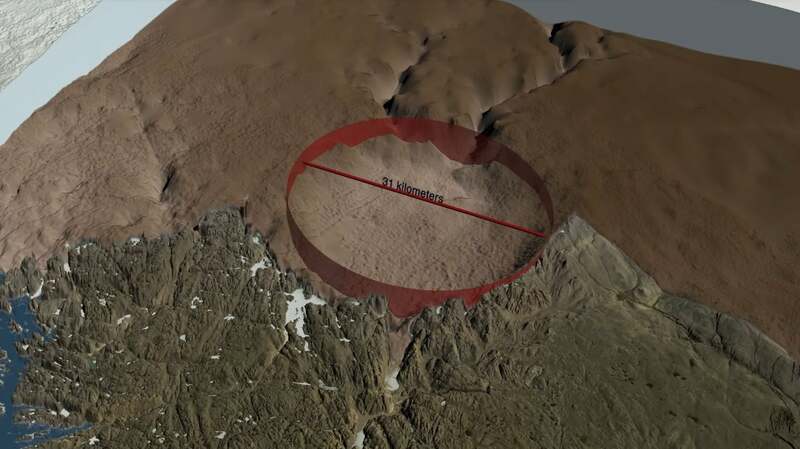 In November, scientists uncovered a 19-mile-wide crater, also on Greenland. The impact crater is located beneath Greenland’s Hiawatha Glacier. Back then, scientists said that the crater was likely formed by a meteorite that hit Earth “less than 3 million years ago.” Additionally, that crater discovery is the first discovery of this kind, found under Earth’s ice sheets. “The crater is exceptionally well-preserved and that is surprising because glacier ice is an incredibly efficient erosive agent that would have quickly removed traces of the impact,” said Kurt Kjær, a professor at the Center for GeoGenetics at the Natural History Museum of Denmark and lead author of the study in a statement on NASA’s website in November 2018. Scientists need yet to confirm that the newly discovered crater was made by a meteorite impact, and if it was, it would be the 22nd biggest impact crater on Earth, NASA announced. To discover the crater, scientists used data from commercial satellites and radar images of bedrock taken by NASA’s Operation IceBridge. The team’s findings were published in Geophysical Research Letters. Scientists also used radar data, ice samples and erosion rate to compare the two craters on Greenland. They found, however, that despite their proximity they weren’t created at the same time. Scientists also developed a computer model which tracked how large craters on Earth have been produced through history. The models however revealed that craters being so close to each other doesn’t necessarily mean they were created at the same time as well. Previously, there were other craters made at a close distance to each other, such as the twin impacts in Ukraine, as well as in Canada. NASA wrote that the time of the impacts are different at those proximate craters. When there is a small part broken off of an asteroid or a comet, it’s called a meteoroid. In close encounter with Earth’s atmosphere, depending on how it burns on entering the Earth’s atmosphere, it can become a meteor (fireball, or shooting stars). While the rocks usually burn up completely while approaching the ground, small chunks of rocks that hit the ground are called meteorites. Some can be quite large, as the discovered impact craters suggest. If the huge crater beneath Greenland’s ice proves to be a meteorite crater, it will be one more confirmed large impact crater on the Earth.